Today is the first day of July, so I thought that for this week I would go over some of my favorite Ruby Engagement Rings since ruby is the birthstone for this month. Each of these rings can also be taken as a suggested engagement ring idea for someone with a birthday this month as well. This engagement ring incorporates the ruby with a recent trend that couples a round stone with a cushion shaped halo. A style like this can be very useful especially if you are shopping for rings with a colored gemstone center stone. Round is the most common shape for all gemstones and it can be quite difficult or rare to find other shapes for certain gemstones. If you can, the stone may come at a premium because of the difficulty of finding a stone in that shape in good quality. So one way to work around this and to have a ruby gemstone center, but also have a ring with a “square” shape to it is to put a round gemstone into a cushion or square-shaped halo. This ring also uses a split shank pave set band to add a runway of sparkle up to the halo that emphasizes the beauty of the center stone. 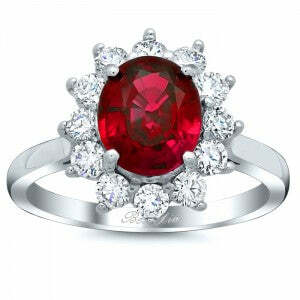 This lovely halo engagement ring places the fiery, passionate ruby into a magnificent floral design. The orientation of the prongs in the halo are such that it creates a petal-like motif out of round diamonds and the band is plain providing more emphasis on the halo and illustrious beauty of the center oval shaped ruby. Along the side, each of the prongs form a sort of net pattern that is very similar to a network of vines or stems and continues the nature-inspired motif in this ring. A ruby five stone engagement ring is my top choice because a five stone ring is the most versatile ring style that can be used for an anniversary, engagement, or even a gift idea just because since the style is representative of the stages of a relationship: friendship, courtship, dating, marriage, and children. The ruby simply gives this ring a more personal touch as a birthstone and a stone that represents power, vivacity, and deeply passionate love. We hope you enjoyed this little look at some of my favorite ruby engagement rings. Rubies are well matched for the month of July and really bring out that hot summer feel. 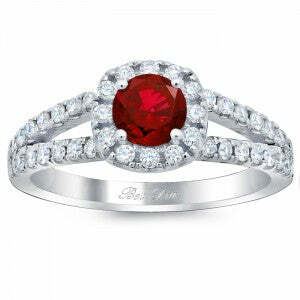 Please feel free to shop the rest of our Ruby Engagement Ring Collection.